I prefer the term ‘Aging with Grace', to ‘Aging Gracefully'. Aging with grace denotes an ease, an acceptance, and yet is also open to all kinds of approaches to the second act. 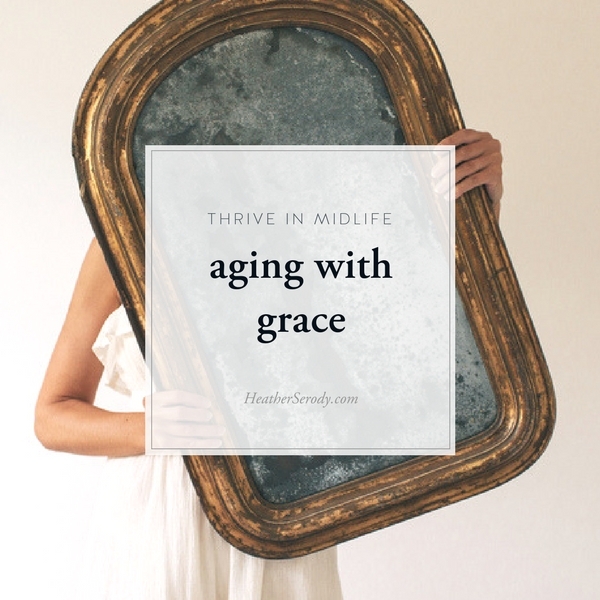 Aging gracefully – sounds more like another directive about how women should be and another standard to which we should all strive. No thanks. It occurred to me recently that I no longer read style or fashion magazines. I used to spend a few hours every month poring over In Style & Vogue. Subjecting myself to countless stylized& doctored images of impossibly thin and young models even well into my 30's just wasn't good for my head. Now that I've stopped I realize that I no longer experience intense moments of yearning for things I don't have, or wishing that I looked different than I do, feel compelled to wear my makeup differently or change the way I dress. These ideas and motivations now hatch from within. Avoiding bombarding myself with external images and articles puts a bubble of protection over my happiness with myself as I am. I highly recommend it. I do ruminate about what kind of 50-something I'll grow into once in while. I wonder whether botox, tucking, nipping, or just letting things happen naturally is right for me. How in the world do you know what's right for you when aging itself is something that's new every morning and always changing? Getting older is challenging in unexpected moments, but I find that those pass quickly. Sometimes, I think we make it harder than it has to be by not being just a little bit more deliberate about how we think about the changes that aging brings. I think it's possible to become an even better version of yourself as you get older. Consciously living this idea of becoming better while growing older is my definition of aging with grace. There is much about aging that is under our control. We can eat really healthy, work out, lift weights, and have a great social life as we get older. Great! We can still wear fabulous shoes and stylish clothes. We all know that aging doesn't have to limit us as much as it used to. Yet…although we may know this intellectually, I also think it is common to at the same time resist the march of time. Cognitive dissonance is the state of having inconsistent thoughts, beliefs, or attitudes, especially as relating to behavioral decisions and attitude change. It's what happens when you think to yourself that you are really great with being middle-aged, but at the same time resist those realities of aging. This happened to me when I decided I wasn't going to color my hair anymore. I thought for sure that this was how I was going to embrace aging gracefully. Two years later after it all grew in, I still hated the way I looked. This is often how it goes with aging. We want to accept it. But the reality of living with those changes might feel much different than you thought it would. what about things we can't change? Wanting two opposing things at the same time keeps us stuck because it requires some sort of change of action or mind in order to fix it. After two years, I finally had to admit that I was never going to like me with gray hair. My ego hates to admit it's wrong. It's not easy to say, you know what? I was totally wrong about this! I told everyone I was letting my gray come in but I changed my mind. My advice is to take the ego hit, and try to resolve your conflicted feeling about aging by changing your hair color, get in shape, getting botox, or whatever! If it makes you feel better, that's the best way age gracefully. Make it your own. But, own it because it's a reflection of who you ARE now, not how you used to be. If cognitive dissonance is happening about things you just can't change, take a closer look at your thoughts because what you think always affects how you feel. If you believe that you can't ever be a happy person at age 55, then turning 55 will be problematic for you. The best news is that your beliefs about aging can be examined and changed. YOU are completely in control of how you think and feel about getting older. I highly recommend that you first become aware of sneaky and often hidden negative beliefs about getting older. Then examine them to see if thinking those thoughts support you. Are they kind? Supportive? Loving? If not, exchange those thoughts for more positive ones if necessary. This is called self-coaching and it is a skill that will help you feel better about anything not just aging. 1. For any challenging aging issue, write down what's bothering you. Just put it all down on paper. 2. Read what you wrote and circle the thoughts that you are thinking about the situation. 3. See how those thoughts are directly connected with how you are feeling. Become conscious that it is always the thoughts that you are choosing to think that are responsible for you how feel, not the circumstances themselves! 4. See how your current feeling affects how you act (or don't act) which affects the results you get in your life. 5. To change things, replace your current thoughts with more peaceful or positive ones. Experiment with how choosing better thoughts will filter down the chain and give you the results you want. Deliberately looking for new and inspiring examples of what aging means and be a powerful exercise in removing negativity from our default concept of aging. There are SO MANY wonderful examples of women who look vital and happy in midlife. Every time I have a look at my Pinterest board called Beauty has no age, it makes me feel really great about being the age that I am and I get really inspired by their style, makeup, and hair. I encourage you to start collecting images of middle-aged women who inspire you to get comfortable in your own skin, too. I'm not saying this is easy work. Sometimes changing your beliefs means undoing 40+ years of our culture that undervalues what it means to get older. I hope that I have given you some new perspectives to help you forge your own trailblazing path into the future and help you shed some hidden negative beliefs in order to bloom into the fully-formed mature version of YOU. It's a path that only you can walk for yourself. This midlife time of life really has no hard and fast rules, but I am sure that midlife is life's next great opportunity for you to fully define who YOU are and who you want to be in your second half, have some fun with it and see it as an experiment in partnering with grace.